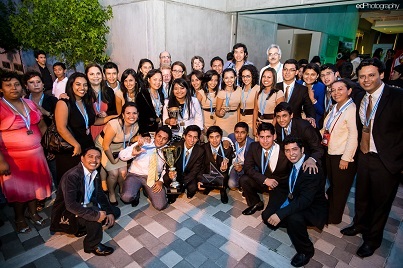 Guatemala City, Guatemala – University of the Valley of Guatemala, Campus Sur was named the 2013 Enactus Guatemala National Champion during the two-day event at the Guatemala Chamber of Construction in Guatemala City. The team’s winning projects included efforts that trained residents in two communities to improve their farming practices, as well as a project that helped women create income by transforming coconuts into crafts and selling the coconut milk and oil. Last year the 36-member University of the Valley of Guatemala, Campus Sur team volunteered hundreds of hours to their various community outreach projects. During the competition teams showcased a variety of community betterment efforts ranging from projects that increased employment opportunities for young people with Down syndrome and sustainable housing models for needy families to training aimed at helping aspiring entrepreneurs develop and market new products. This year’s competition also featured forums with top business leaders from GNC Guatemala, Clorox and Livsmart who discussed the role of entrepreneurship in professional and personal life. A special thanks to event sponsors Livsmart, Colombina, Guatemalan Chamber of Construction, GNC, Incaparina, EdPhotography, Web Solution, Pablo de la Roca, Analytical Solutions, Prisma Concept, Zone 14 Shukos, Global Electronics, Ministry of Economy, Government of Guatemala and La Vinoteca.